Who is the program for? All local residents including seasonal staff, newcomers, and business owners. All local residents new and old are welcome to participate in this great, free initiative to expand their knowledge of the area and increase their participation in the community. How do I register? It’s simple! Once current course dates are confirmed, complete the online registration form and mark your calendar! Participants of the Ambassador course will receive an Ambassador Card. Show your card for discounts and benefits at many local businesses! 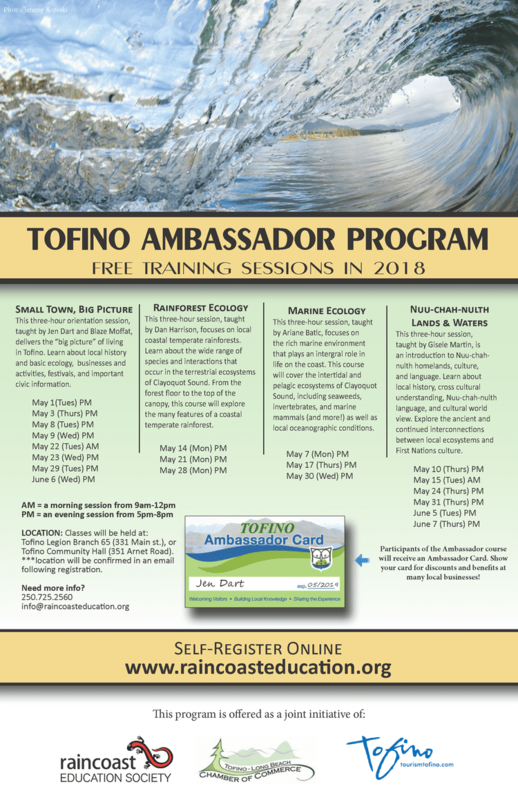 This FREE program is offered as a joint initiative of the Raincoast Education Society, the Tofino-Long Beach Chamber of Commerce, and Tourism Tofino. The Raincoast Education Society is responsible for course curriculum, registration, and program delivery. This three-hour session focuses on the ecology of coastal temperate rainforests. From the forest floor to the top of the canopy, this course will explore the species and interactions that occur in this ecosystem and the many factors that create a coastal temperate rainforest. Small Town, Big Picture is a suggested prerequisite for this course. 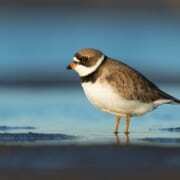 This three-hour session focuses on the rich marine environment that plays an integral role in life on this coast. This course will cover the intertidal and pelagic ecosystems of Clayoquot Sound, including seaweeds, invertebrates, and marine mammals (and more!) as well as local oceanographic conditions. Small Town, Big Picture is a suggested prerequisite for this course. This three-hour session is an introduction to Nuu-chah-nulth homelands, culture, and language. Learn about local history, cross cultural understanding, Nuu-chah-nulth language, and cultural world view. Explore the ancient and continued interconnections between the local landscape, the ocean and First Nations culture. Small Town, Big Picture is a suggested prerequisite for this course.